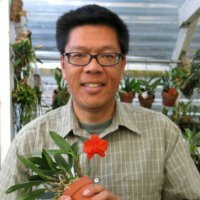 Due to limited growing space, Peter likes to specialize in miniature orchids, both species and hybrids, for which he has received numerous AOS awards. His other interests in orchids include Dendrobiums, Angraecoids, and Neofinetias (now Vanda). He maintains a collection of a thousand or more orchids at his home in Southern California in 3 small greenhouses, as well as in an offsite greenhouse. Peter will be bringing with him some of the many interesting orchids he has to sell. The plant table will consist of Cattleya divisions and Aussie Dendrobium seedlings donated to our society by Fred Clarke.